All aboard! 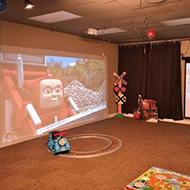 Ride along with Thomas the Tank Engine and friends for an amazing party experience. With our 3D theater, your guests will be surrounded by the sights and sounds of the town and train station. The conductor will be there to guide the kids through all the magic of this party. 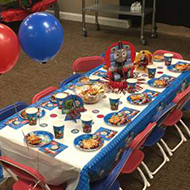 We offer three train birthday party packages at our Palatine, IL location: gold, silver, and bronze. 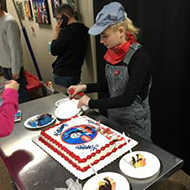 In Every Train Birthday Party Theme Package. 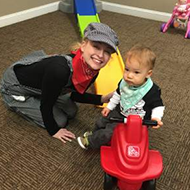 If you prefer to have a home party, our kids party characters can come to your venue. Reverend Wilbert Awdry published the stories of The Three Railway Trains in 1945. Thomas and his friends were born out of stories Awdry told his son who had been sick with the measles. Thomas the Tank Engine was popularized by the British show Thomas and Friends which hit the airwaves in 1984. Alec Baldwin, Ringo Starr, and George Carlin have all narrated episodes.